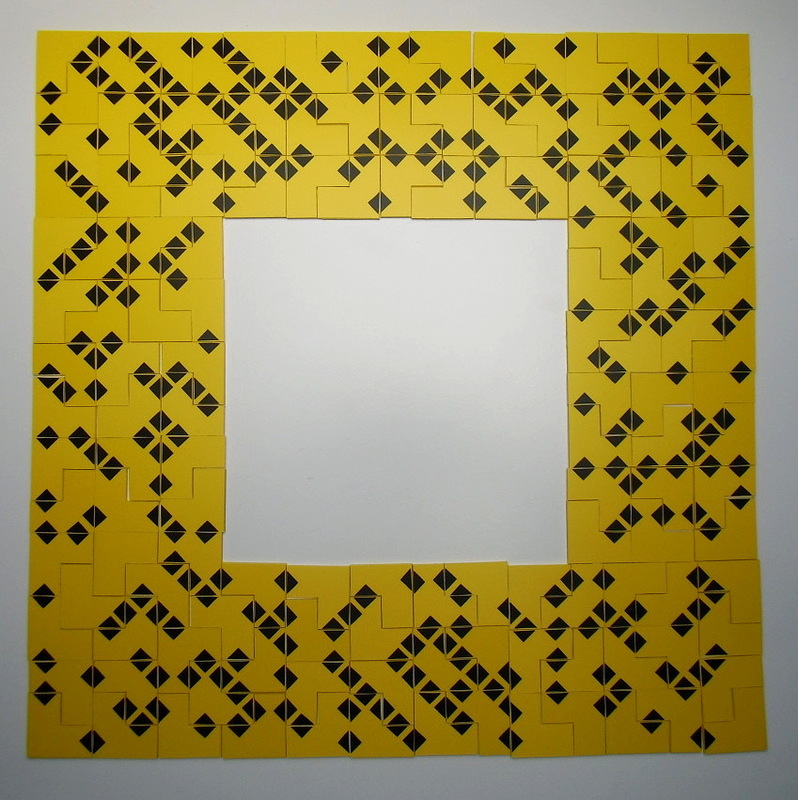 The picture above shows a construction with square symmetry using all 136 V-trominoes with up to 8 notches. For two-sided and one-sided V-trominoes with a given number of notches the number of different pieces and some possible constructions are listed in the following table. 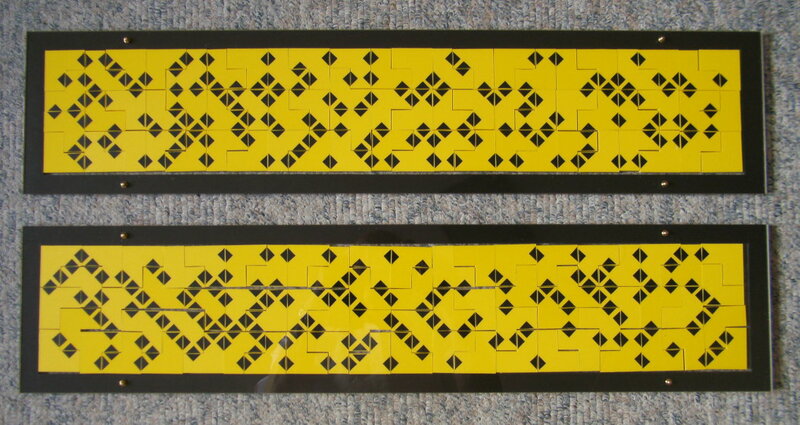 Here are the 16 V-trominoes with two notches packed in a 6x8 rectangle. 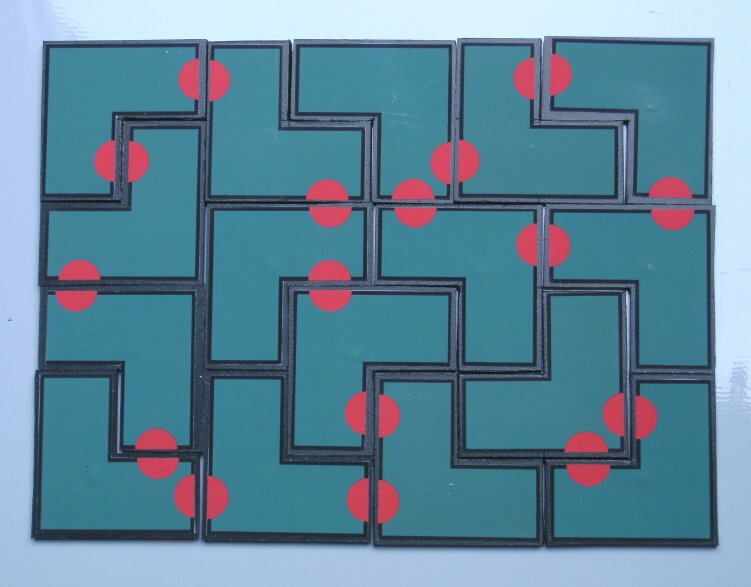 This is the original puzzle inventented by Junichi Yananose, which he called Holey Rectangle. I constructed a version made from hard foam board with adhesive labels on both sides of the pieces. Little magnets inside the hard foam allow to fix the pieces on iron material. The following examples of symmetric figures can also be covered and solutions are provided. In the 7x7 square you can choose all other positions for the missing monomino except for the center and the four neighboring squares. If we add the four pieces with one notch the toal area is 60 and rectangles of size 4x15, 5x12 and 6x10 can be constructed. The whole set of pieces with 0 to 2 notches allows for a 7x9 rectangle. Let's have a look at the V-trominoes with three notches, where the pieces with one notch at the square in the corner are red colored. I call these pieces odd and the other ones even. You can't get a rectangle with this set of 28 pieces. Suppose we have a checkerboard colored rectangle covered with the 28 pieces, then there must be 14 pieces covering black squares with their corner squares. Without loss of generality we can assume that an odd number of the 15 odd pieces is among them. Otherwise we can switch colors. Together with the even pieces it follows, that all 14 pieces contribute an odd number of notches to black squares. Among the other 14 pieces with their corner squares on white squares there is an even number of odd pieces and an even number of even pieces. Since the corner squares of these pieces cover white squares the other squares contribute an even number of notches to black squares. Therefore all 28 pieces would contribute an odd number of notches to black squares, which can't be true, because 28*3/2=42 notches must be at black squares. If we add the 4 pieces with one and the 16 pieces with two notches to the set, we get 48 pieces and can make 6x24 and 8x18 rectangles or a 12x12 square without any parity problems. You can also take the whole set of pieces with 0 to 3 notches and can construct a 7x21 rectangle. Sets of pieces with 0 to 4 or 0 to 5 notches can cover rectangles of size 9x29 or 15x23, respectively. Solutions are easy to get, if better tileable pieces are saved for the end of the search procedure. There are 135 pieces in the set of pieces with 0 to 7 notches. The total area is 135*3=405 which factorizes very well. Rectangles of size 9x45 and 15x27 can be covered, but for the border of the 5x81 rectangle there are too few pieces with notch free sides of length 2. The 15x25 rectangle was divided into two smaller stripes with preset notches to facilitate the computer search. The solution for the 9x45 rectangle consists of two rectangles of size 27x9 and 18x9. 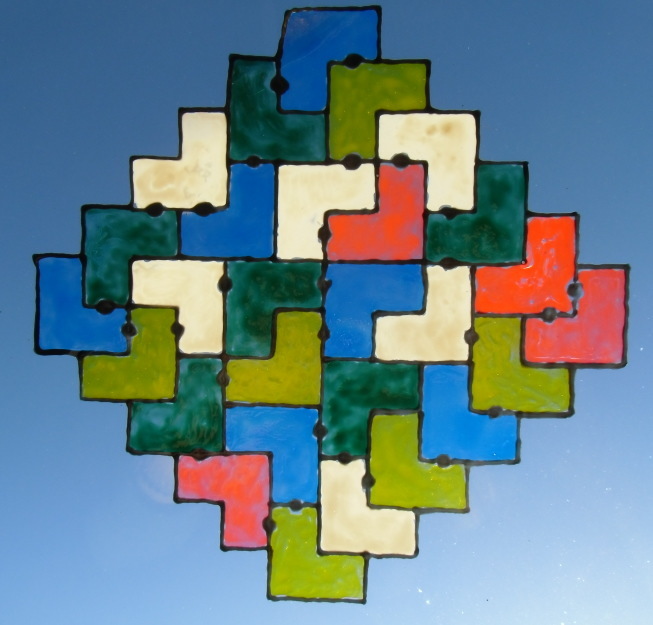 With these parts you can make 9-fold replicas of the I,L,V,T,N and P-pentomino. For the other pentominoes a construction should also be possible. I tried to do it for the X-pentomino by solving two 9x9 squares and one 9x27 rectangle with 3 or 6 preset notches, respectively. At last I cut 136 pieces V-trominoes from hard foam board and attached small adhesive triangles as notches to get physical pieces of all possible 136 V-trominoes. Then the pieces were arranged in groups due to their number of notches to find the suitable pieces for the construction a little bit faster. The total area is 136*3=408=2*2*2*3*17 and two 6x34 rectangles with straight borders can be made. This provides the solution for a 6x68 and a 12x34 rectangle. The 17x24 rectangle is possible, too. With two L-shaped constructions you can get a square ring of size 23�-11� shown in the title or a 23x17-17x5 ring. The set of one-sided V-trominoes with two notches has only 28 elements with a total area of 84 and may be used for hand solving. It is shown in a jagged square made from peel-off color with the sky as background. Some other symmetric constructions and rectangles of size 4x21, 6x14 and 7x12 can also be covered. The last two rectangles can even be solved by combining two 6x7 rectangles. Because there are no symmetric V-trominoes with three notches, we get two one-sided pieces for each two-sided one and there are no parity problems with these 56 pieces. Construction an be made by splitting the figure into two symmetric parts, one of which can be solved with the two-sided set and the other one is given by reflection. I have done this for 7x24, 8x21 and 14x12 rectangles. 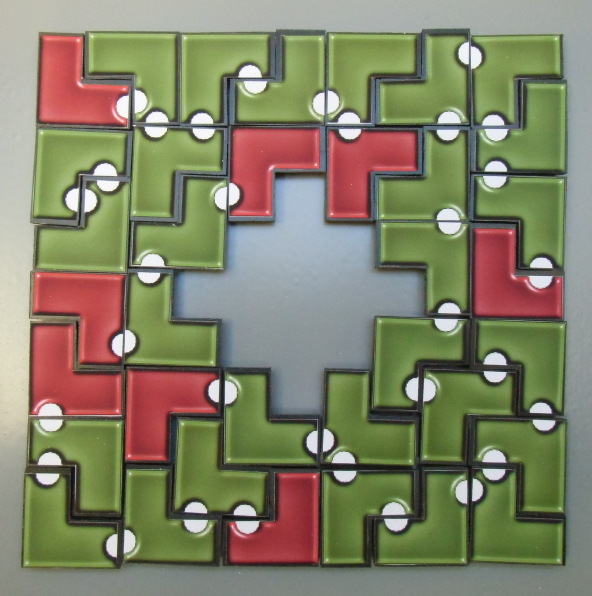 Since the eight one-sided V-trominoes (red colored) with only one notch can fill neither a 6x4 nor a 3x8 rectangle we can add the set of pieces with two notches (green colored) and some new constructions are possible. The set has 36 elements and allows for some symmetric figures and rectangles of size 4x27, 6x18 and 9x12. Even three 6x6 squares are possible. The 92 V-trominoes with 1, 2 or 3 notches can cover a 6x46 rectangle and a 12x23 rectangle. The last rectangle is given by the 12x9 rectangle made from pieces with 1 or 2 notches and the 12x14 rectangle made from pieces with three notches. Adding the V-tromino with no notch, we can get a 9x31 rectangle. A 18x9 part was built from pieces with 3 notches leaving a pair of symmetric pieces. This pair and the pieces with 0 to 2 notches complete the construction.